Violence continues in the Middle Eastern countries as world powers meet in New York. The UN Security Council held an emergency meeting on May 28 to discuss Syria following the massacre of dozens of civilians in the Syrian village of Houla. The three-hour-long closed meeting ended with the somewhat non-committal publication of a press release stating that the Security Council “condemned in the strongest possible terms the killings, confirmed by United Nations observers, of dozens of men, women and children, and the wounding of hundreds more.” The primary responsibility for the attacks rests with the Syrian government, although the statement acknowledges that other parties may also have had a hand in the killings. Russia, which continues to back the Syrian regime, has called attention to the ambiguous situation in the region where the tragedy took place. “You can’t place the blame for the tragedy in Houla entirely on the Syrian government [because] government troops hadn’t entered that village,” said Alexander Pankin, Russia’s representative to the UN, in a statement. The Russian diplomat did not exclude the possibility that the events in the village of Houla “could have been the result of provocation.” This feeling was echoed by representatives of a number of countries during the Security Council session, according to Pankin. The tragedy in Houla also hastened the emergency visit of British Foreign Secretary William Hague to Russia. But, as the resulting press conference clearly showed, he was ultimately unable to win Moscow to his position. “We are not supporting the Syrian government. 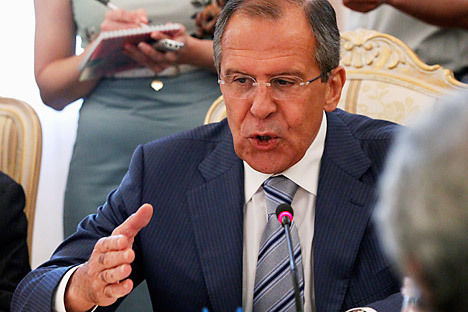 We are supporting Kofi Annan’s plan, which is directed towards both the Syrian government and the armed opposition,” said Russian Foreign Minister Sergei Lavrov. At the same time, he said that, in order to avoid a repetition of the events in Houla, it is necessary for all foreign players to be on the same page in terms of implementing a peace plan – not a regime change – and deciding where their priorities lay: with their geopolitical goals, or with saving lives in Syria. At the press conference, Lavrov recalled the events of 1999 in the village of Račak in the former Yugoslavia. “The Head of the OSCE mission arrived and, with no authority whatsoever, announced that genocide had taken place in Račak. That announcement essentially became the primary motive to start bombing Serbia, which was unsanctioned and in violation of all conceivable OSCE documentation and the UN Charter,” said Lavrov. He added that, after these events, the European Union commissioned a group of Finnish pathologists to determine what really happened in Račak. The report prepared by the independent group of experts repudiated the official version. Moscow demands a thorough investigation of the Houla tragedy. But, perhaps more importantly, Russia has shown a clear lack of trust in its western partners. Moscow, which is blocking any kind of resolution by the UN Security Council to allow regime change, has not made any direct response. But it became clear on May 29 that the Kremlin has no intention of changing its line on Syria. For its part, the United States is continuing to work on Russia. Citing official sources in the U.S., the New York Times reported on May 28 that U.S. President Barack Obama discussed the issue with Prime Minister Dmitry Medvedev during a meeting at Camp David earlier in May. According to the paper, during discussions about the Syria situation, President Obama used the example of former Yemeni President Ali Abdullah Saleh, who was granted immunity as part of an agreement to transfer power and step down.